A classic Chinese dipping sauce from Hong Kong, and often used with Thai-inspired dishes. Koon Chun brand is one preferred by chef's--it's a very good quality product. Hoisin sauce leading flavors are fermented soybeans, sugar, garlic, chiles and vinegar. 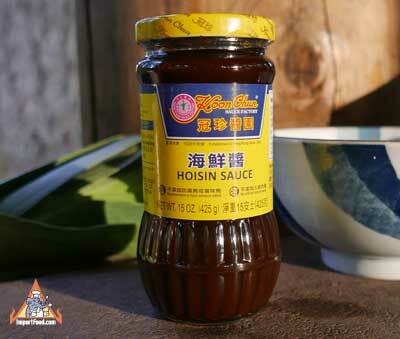 We love serving Hoisin along with Pho Beef Soup (see recipe). Packed in a glass jar. Ingredients: sugar, vinegar, soyabean, water, salt, wheat flour, garlic, sesame seed, chile, spices & artificial color. Product of Hong Kong. ImportFood.com's Hoisin Sauce is recommended by Mark Bittman (New York Times). A "Fine Cooking" magazine Tasting Panel chose Koon Chun brand as the best hoisin sauce available. We also offer Koon Chun brand plum sauce. This recipe is from our "Thai-American" section, which contains dishes that would not typically be found in Thailand. This one is definitely a crowd-pleaser. It works best if you use a smaller-sized spring roll wrapper(approximately 6-8 inch diameter) same as what we offer. We prefer wild salmon for this recipe, which can be steamed (as we did in photo below) or simply baked for 15 minutes or so, we like to use a small toaster oven to bake salmon. This Asian-inspired recipe blends together so well it could be found on the menu of the finest restaurant you've ever been to. We loved making this one. The tenderloin beef and wasabi sauce elegantly match the citrusy sweet potato and hoisin salad, the result is true perfection especially if you're a beef lover. Before we made this recipe, we thought you had to go to the Saochingcha area of Bangkok to get the tastiest red pork. No restaurant we've ever been to in America has ever offered anything that comes close to the flavor of this pork. So easy to make, and the results are astounding. We recommend serving this with duck-fried rice with tamarind sauce.